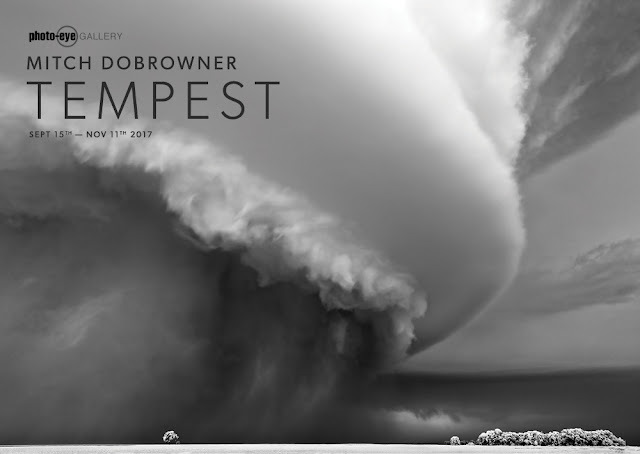 Mitch Dobrowner – Tempest photo-eye Gallery is proud to announce Tempest an exhibition of recent black-and-white storm photographs from represented artist Mitch Dobrowner – including the debut of several NEW images in the acclaimed series. Tempest opens Friday, Sept 15th with an Artist Reception from 5–7 pm and continues through Nov 11th, 2017.
photo-eye Gallery is proud to announce Tempest an exhibition of recent black-and-white storm photographs from represented artist Mitch Dobrowner – including the debut of several NEW images in the acclaimed series. Tempest opens Friday, Sept 15th with an Artist Reception from 5–7 pm and continues through Nov 11th, 2017. Mitch Dobrowner will give an Artist Talk at the Gallery on Saturday, Sept 16 beginning at 4 pm. For nearly a decade, Mitch Dobrowner has ventured out with professional storm chasers into the American heartland photographing the energy of a wondrous and sometimes perilous planet. Storms themselves are inherently paradoxical, representing both significant disruption and necessary recharge to the environment in a single event, and Dobrowner’s images often feel sublime as we witness torrential rain dropped by a 50,000ft helix, mile-high tornados, and bolts of lightning from the comfort of the gallery floor. These dualities are central to the series. While photographing, Dobrowner keeps the words of Edward Abbey as a kind of mantra: “Our job is to record, each in his own way, this world of light and shadow and time that will never come again exactly as it is today.” A modern master printer, Dobrowner’s work is well seated as a contemporary member in a long and honored line of American landscape photographers.